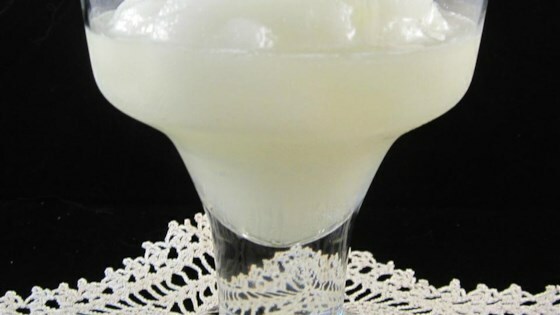 "Authentic margaritas call for lots of fresh lime juice - both expensive and time-consuming. I've found I can shortcut the process by using frozen limeade. And for a festive non-alcoholic drink, combine a 12-ounce can of limeade (thawed) with a 48-ounce bottle of sparkling water." Working in 2 batches, place 1 quart ice cubes in a blender. Add 1/2 can limeade, 6 ounces tequila and 2 tablespoons Cointreau. Blend at highest speed until drink is almost smooth. Pour into a pitcher and repeat with remaining ingredients. Store in the freezer. To salt the margarita glasses, pour a single layer of salt on a salad plate. Moisten each glass rim with lime; dip each rim in the salt. Pour margaritas into each glass; garnish with lime. Serve immediately. Yummy! And you can change the flavor really easily by adding any Pucker flavor to the drink. Strawberry, Watermelon or Island Blue are my favorites! Very easy and good. These are just the right amount of sweetness. I used Triple Sec, instead of Cointreau, since the Cointreau is so expensive. They are so simple to whip up for a gathering! Very good recipe! Make sure you don't put too much ice in the blender at once. I had to remove some in order to get it crushed. The perfect margarita. We use regular triple sec and it tastes wonderful. Not as expensive to make as the premade store bought mixes. Thanks. Very easy, very good. Tastes a lot like the ones at a local Mexican Restaurant to me. Very nice recipe. I will be making these again. Thank you! I use a similar recipe. Instead of the cointreau I add a corona. Gives it a little fizz and an extra kick!! A winner EVERY time! !